NBC Boston talks to Noelia Cruz, who's re-opened the AC Hardware on Tremont Street that was owned by her father Andres, until he was murdered there a year ago today. 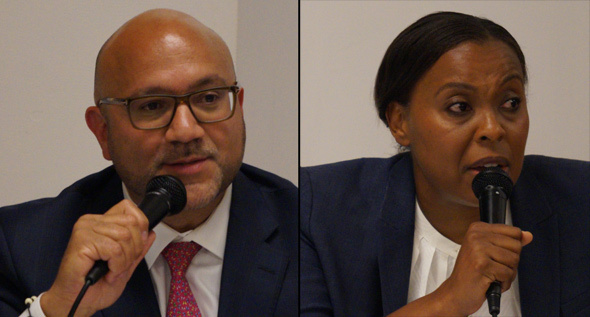 The Cruz family will hold a memorial today at 4 p.m.
State Rep. Jeffrey Sanchez (D-15th Suffolk) and challenger Nika Elugardo agreed on more than they disagreed on, at a candidate forum in Jamaica Plain last night. Instead, the two battled over who was the most progressive - and how to fight for progressive values - in one of the state's most progressive districts, which includes parts of Jamaica Plain, Mission Hill, Roslindale and Brookline, in a room at the First Baptist Church that was so packed people were turned away at the door. Read more. Boston firefighters responded around 6:20 p.m. to 80 Terrace St., for a fire in the rear of an abandoned house. The cause is under investigation. A car on Horadan Way and a residence around the corner on St. Alphonsus St. were hit by gunfire around 11:10 p.m. No people hit. The MBTA reports dead trains aplenty on the E Line past Brigham Circle, and is advising riders to try to squish onto a 39 bus instead, at least until 7 p.m.
Jamaica Plain News interviews Nika Elugardo, an aide to state Sen. Sonia Chang-Diaz, who is running against incumbent state Rep. Jeffrey Sanchez in the 15th Suffolk and Norfolk district (Jamaica Plain, Mission Hill, Brookline and Roslindale). 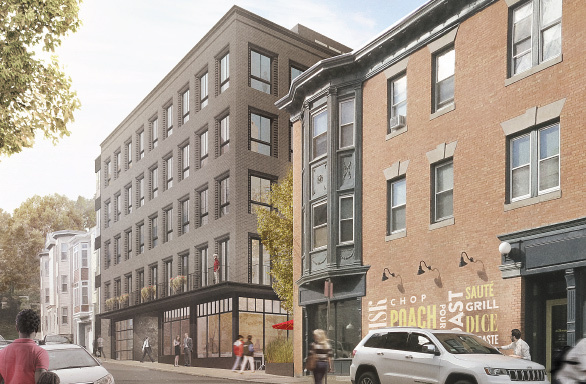 The Board of Appeals yesterday delayed action on a proposed four-unit building on Hawthorne Street in Roxbury and a proposed duplex on Fisher Avenue on Mission Hill to give developers and neighbors more time to try to resolve their differences. Read more. Police have flooded Mission Hill and the neighboring section of Roxbury to look for a guy who's been busy the last week or so setting fires, most recently one tonight next to a house on St. Alphonsus Street on Mission Hill (per Stacos) and one in a dumpster behind the Whittier Street Health Center on Tremont Street. BFD arson investigators would also like a word with the suspect, described as a light-skinned black man in a black coat and khaki pants and possibly wearing a black hat. Fire scene. Photo by BFD. 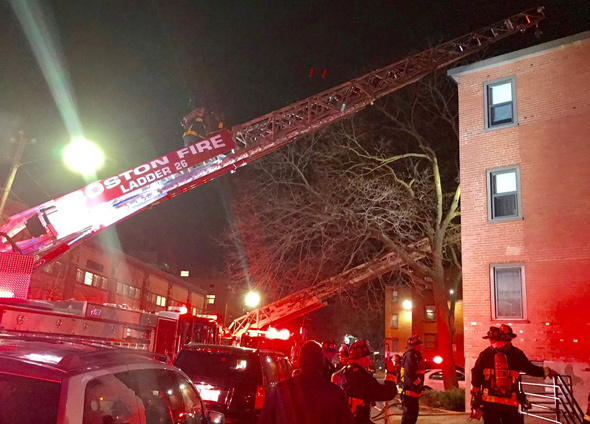 The Boston Fire Department reports a two-alarm fire at 86 Annunciation Rd. sent one woman to the hospital in critical condition tonight. Firefighters responded at 7:36 p.m. to the three-story building for what turned into a two-alarm fire. The cause of the fire, which caused an estimated $75,000 in damage, is under investigation. Boston Police report arresting a man they say carjacked a car at a Huntington Avenue gas station, crashed the car, then tried to use a credit card he found in the car to buy some booze early yesterday evening. Read more. Architect's rendering (new building on left). A developer that has already put up three new buildings along Tremont Street on Mission Hill has filed plans with the BPDA for a fourth - a 31-unit residential building at 9 Burney St., just off Tremont. Read more. 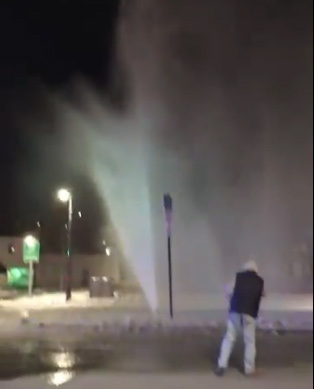 Jessica Feldish got some video of an MWRA water main turned geyser on Huntington Avenue outbound, at the Brookline line just past where it goes under the Jamaicaway. Needless to say, avoid the area. UPDATE: Rice held in lieu of a total of $157,500 bail on charges related to the Dec. 20 shooting and his arrest; Clay held in lieu of $25,000 bail, but had his bail on a Plymouth County matter revoked, the Suffolk County District Attorney's office reports. Boston Police report arresting a Roxbury man and his father for a double shooting on Mission Hill on Dec. 20 - and say the guy is a suspect in three more shootings in the area. Read more. NBC Boston reports two men in a car were shot at Parker and Gurney street early this evening. 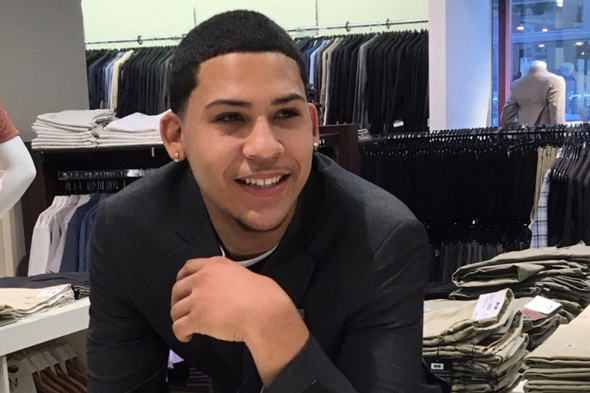 Friends have identified the man shot to death at Tremont and Parker streets as Jose Montero. Among his friends: Adam Foss, a former Suffolk County assistant district attorney who now heads a criminal-justice non-profit group. Foss has set up a GoFundMe page to help Montero's family pay his funeral expenses. Read more. In the leg, shortly before 5:40 p.m. in the rear of 260 Ruggles St., near Annunciation Road. 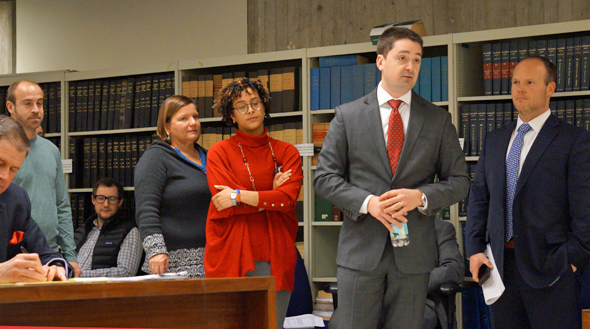 Zakim makes rare appearance at licensing hearing in support of Laughing Monk. The Boston Licensing Board today chose an existing Mission Hill Thai/sushi restaurant for the one liquor license it had over a proposed shaken-seafood place in Roslindale. Read more. UPDATE: Jose Montero, 19, (shown right) died later that night. Ameen Lacy, 17, (left) died on Dec. 8. GoFundMe pages set up for the families of Montero and Lacy. Scan Boston reports that shortly before 8 p.m., two people were found shot on Parker Street near Tremont and that a third victim was found shot in the back on Sewall Street, on the other side of Tremont. At least eight rounds fired shortly after 8:30 p.m. on Annunciation Road near Parker Street. At least two cars hit. It had a flashing blue light. I wonder who they are spying on.